Disabled Yoga Accessible Worcester UK is now available. If you are injured, have a chronic illness, are elderly, bedridden or experience a disability Yoga can be a great tool. Disabled Yoga, accessible in Worcester UK since June 2017. With extensive training in Yoga for those from a special population, Yoga 7 delivers Yoga to people with a disability in Worcester making Yoga accessible to everyone. All venues are wheel chair friendly and all have free parking for students or parking close by. Personal Tuition to disabled people and those with specific needs, for example injury, chronic illness, age or people bed ridden find that a regular Yoga Class helps on so many levels. If you are recovering from an injury, a class is adapted to suit ensuring that the benefits of Yoga are available for you so its important to say if you have any injuries or ailments. As a UK Ambassador for Accessible Yoga, I will be raising awareness on special population Yoga Classes among fellow Yoga teachers in the UK with the first one being October 2018. Yoga 7 is passionate about making sure that Yoga is accessible for everyone and is privileged to have taught Yoga to Para Olympic Athletes who competed in the Para Olympics in Rio 2016, Yoga classes to those receiving palliative care, young people with psychosis and people recovering from chemotherapy treatment and breast cancer. Yoga 7 is also experienced teaching Yoga Classes to those with sight and hearing impairments, neurological disorders, Hemihypertrophy, Multiple Sclerosis, Parkinson’s disease and Alzheimer’s disease. Please don’t let your disability inhibit your yoga practise or stop you from starting this amazing tool offering endless health benefits. Most of us have our weaker or stronger areas regardless of how fit and flexible we may be and so it has always been important for me that no one be excluded from having a Yoga practise because of an ailment, injury or disability. Having a fractured pelvis and two knee injuries, I have had to adapt certain postures over the years in my own personal practise, fortunately for me these don’t restrict me too much these days thanks to my ongoing Yoga practise. Accessible Yoga and Disabled Yoga, involves making slight and sometimes extensive modifications to incorporate each individual to the class. 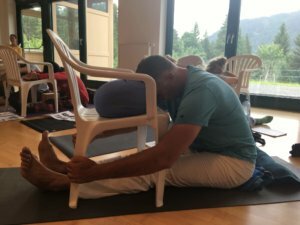 Being taught in a chair or on a bed depending on the need of each student makes it so that Yoga can be practised by every body. Props such as blocks, a bed, chairs and straps are used. The focus when teaching an accessible yoga class is on what works and not on what doesn’t, so a disabled student is given options as to how best utilise their body as it is at any given time. Research has shown how long-term sedentary behaviour increases the risk of health conditions like heart disease and type 2 diabetes, as such inactivity is considered to play a direct role in the development of insulin resistance. The importance of using and moving the body when ever possible is key to a longer and healthier life. So its vital to work with the body you have using it as fully as is possible as often as you can. Having a Yoga practise enhances your movement, strength and flexibility as well as assisting in relaxing the mind and body, with the guided mediation at the end, you may experience a sense of lightness in your body afterwards and a sense of peace and inner calm. The practical application of yoga techniques and the psychological insight necessary for helping disabled yoga students are all taken into consideration so as to better utilise each Yoga Class. If you have a disability and are interested in trying a disabled yoga class, and you are unable to access any of Yoga 7 classes in Worcester, I can come to your home for personal tuition to spend any time necessary to cater for your needs. Otherwise all Yoga 7 venues in Worcester have wheelchair access and so are accessible to all. If you are not sure if the practise of Yoga is suitable for you then contact your GP and once you get the thumbs up from them, get in touch and book a class online or call to discuss. Yoga 7 is for every body.